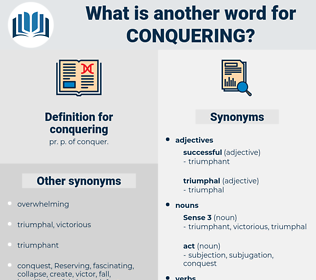 What is another word for conquering? Eradicating, Capturing, reopening, Combating, openning, opening, Attracting, climbing, pursuing, Gaining, breaking, beating, Fatah, taking. 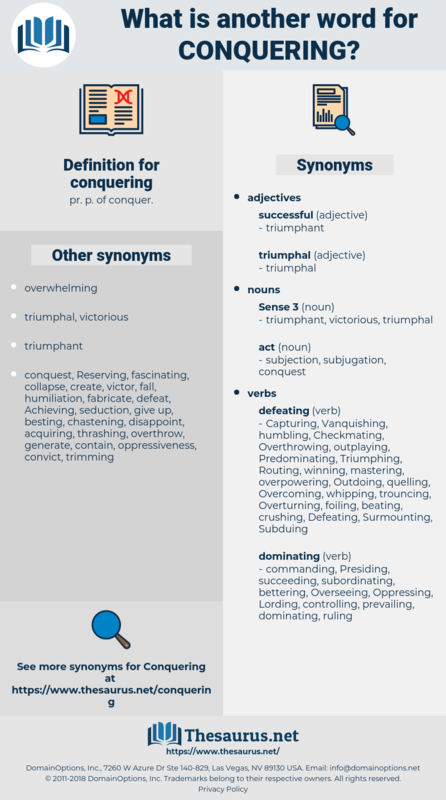 overpowering, Overcoming, Securing, Vanquishing, Achieving, fighting. The good people of Plymouth, as is customary, cheered us as we left their shore, wishing us the most ample success and good fortune, and which we, who had for so long a time been in the habit of conquering, did not for a moment admit a doubt of being fully realized. Hold on to me behind, somebody, for I must see ef I do pitch into the gutter, cried Mrs. Wilkins, with a gasp, as she wiped her eyes on her shawl, clutched the railing, and stood ready to cheer bravely when her conquering hero came. chincherinchee, conjuring, Concurrency, censoring, congruence, concurrence, coinsurance, concurring.